I wanted 300 in 3D. I didn't get it. Immortals was as violent, probably more but that wasn't the problem. 300 was pure awesomeness; Immortals was not. The movie had an interesting plot but it wasn't developed. Hyperion was supposed to be this evil king but he was merely an annoying and disgusting human being. I didn't see him as this force to be reckoned with. I didn't believe in the character's relationships, especially the one between Theseus and Phaedra. It lacked any substance. The characters were boring cliches. The only memorable ones were the gods and that's only because they had the best fight scenes. The visuals were impressive though. Despite it being pointless in 3D (how many times have you heard that before), it was really nice to look at. 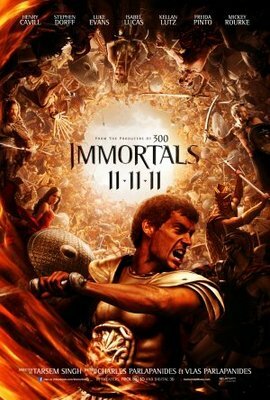 I hate to use the phrase visually stunning but it's the best way to describe Immortals. I liked the ending. Like 300, it wasn't all sugary sweet. The whole good guy beats bad guy, gets the girl and they live happily ever after wouldn't fit this movie. It wasn't as simple as that. Immortals couldn't have had any other ending. The plot just fell flat. It would've been better if it was longer. That being said, I didn't leave the theater groaning over the wasted money. I don't regret seeing it. It had potential. Immortals could've been a great movie. Thnaks a 300.:) I'll wait for it on Netflix. I pretty much gave up on this before it was in theatres. I knew it was from some of the same people who made 300, and had nothing to do with the actual myth of Theseus. Not suprising. The movie is rarely faithful to the original story.